We previously reported that a certain type of speed camera used by the State of Maryland’s ‘SafeZones’ program may not meet a requirement that the be certified by an independent lab. It turns out that another type of camera used by Baltimore County may run afoul of the same restriction, since the device’s annual calibration certificates are issued by the manufacturer rather than by an independent calibration lab. "(4) (i) A speed monitoring system shall undergo an annual calibration check performed by an independent calibration laboratory. 2. Shall be admitted as evidence in any court proceeding for a violation of this section." A supporter provided StopBigBrotherMD.Org with copies of Baltimore County’s annual calibration certificates. 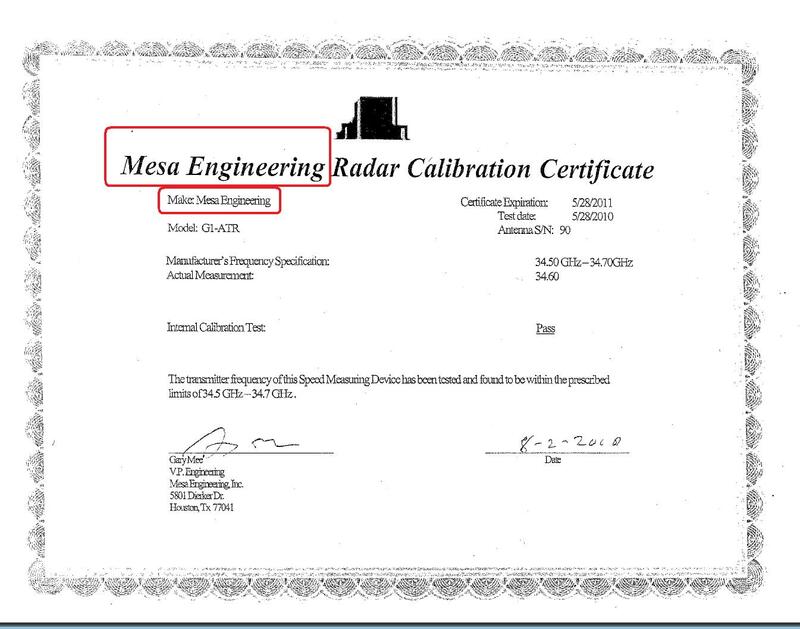 The certificates show the Make (Manufacturer) of the “G1-ATR” cameras to be “Mesa Engineering”, the same company who issued the certificates, which were signed by Mesa’s VP of Engineering. StopBigBrotherMD.org wrote to Baltimore County on March 12, asking a number of questions, including among other things what the legal basis for considering the manufacture an ‘independent lab’ is, the credentials for this company to perform such testing, and what type of testing this device was actually subjected to. We received confirmation that our inquiry was received by Baltimore County police, but after two more business days received no answers to any of those questions. The certificates appear to declare that the “Internal” Calibration Test “Passed” but does not state anything about any actual speed measurements on actual moving vehicles. The certificate includes the statement "The transmitter frequency of this speed Measuring Device has been tested and found to be within the prescribed limits of 34.5 GHz - 34.7GHz". One could infer from this is that all the device is “certified” for is that it is transmitting on the correct frequency, without ever confirming that this means that it produces accurate speed measurements, let alone that it can do so 100% of the time when operating unattended in ALL real world conditions, or for example that it is capable of reliably distinguishing between multiple vehicles if they are near each other. Of course it could be that there was much more extensive testing, but one cannot divine this from the certificates themselves. A Manufacture has a financial incentive to declare the device infallible, because if they showed the device was capable of producing errors nobody would buy them. Likewise the contractor and the County both receive a share of the citation revenue, hence the requirement that the testing lab be “independent”. The Mesa Engineering G1-ATR does not appear on the International Association of Chiefs of Police (IACP) list of conforming law enforcement products which is generally considered the highest standard for certifying speed enforcement devices. However this is not a requirement under Maryland Law for speed cameras. In fact there is no specific requirement for accuracy stated under Maryland law, or any clear definition of what annual calibration testing needs to consist of for that matter. Yet it seems that it still might have been too difficult for Baltimore County and their contractor, ACS State and Local Solutions, to meet this extremely weak requirement that an “independent” lab declare the device accurate. The devices are also required to undergo a daily “self-test”, which agencies running cameras typically claim ensure accuracy, but the reality is that those self-tests do not perform any type of speed check at all and for all anyone knows will always say ‘PASS’ as long as the machine has power. The annual calibration test is the ONLY required test which could possibly validate the accuracy and reliability of the device, and if it does not do so then there is no independent validation that the evidence produced by the machines is trustworthy. We have discovered that Baltimore City, whose program is several times larger than Baltimore County, also uses some G1-ATR cameras, however we have not yet obtained the certificates or determined the number of those devices in use. Baltimore City also uses ACS State and Local solutions as their contractor, and it seems likely, although not certain, that their devices went through the same certification as the ones in Baltimore County. The State of Maryland’s Vitronic Poliscan cameras, and their manufacturer-issued certificates, were also provided by ACS. 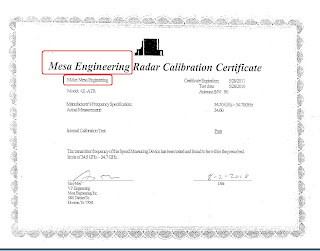 UPDATE: as of June 2011 we obtained a annual calibration certificate dated from 10/2010 expiring 10/2011 for a Mesa Engineering camera which had been issued by Mesa Engineering, the manufacturer. So apparently the same problem did exist with Baltimore City's certifications during that period of time. 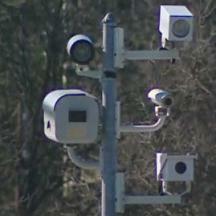 While this issue could be the basis for challenging speed camera tickets, it may or may not be enough to win a case in District Court, where judges often assume the devices are infallible, accept the local government’s interpretation of the law even if it conflicts with the text of the law, and presume defendants to be guilty. It is likely one would need to appeal the matter to a higher court which is authorized to divine legislative intent. Unfortunately, state lawmakers saw fit to reduce the burden of proof to the point where defendants are no longer given the benefit of the doubt, for requiring no oversight of county and local programs to ensure they comply with the terms of the law, and for creating a situation where local governments might conclude that they can earn more revenue by breaking the law and then hiring teams of lawyers to circumvent the restrictions in court, rather than complying with them. Baltimore County recently voted to expand its speed camera program from 15 sites to an unlimited number of cameras and renewed ACS's lucrative contract with the county after an "Astroturf" PR campaign funded by ACS. This was despite the fact that a report released by Baltimore County Police showed no reduction in accidents at Baltimore County speed camera sites.